If you’re looking to keep your skin hydrated in the sweltering summer heat, look no further than TREETS TRADITIONS! Their trio of body oils and hand cream comfort tired and dry skin with effortless nourishment. Spotlighting a unique blend of herbs our ancestors have passed down through generations to provide healing and nurturing, TREETS TRADITIONS body oils and creams help rejuvenate and restore parched skin for the ultimate end of summer glow. Rediscover and cherish mother nature’s gift with their sooting hand cream, Energizing Secrets. This moisturizing cream protects against UV rays and is free of parabens, silicones, colourants and mineral oils, made from a tried and true recipe for today’s beauty needs. I love that it is so fresh and clean, and non-greasy. Your skin soaks up all its goodness and feels nice and soft. TREETS TRADITIONS body oils are perfect for a massage, in the bath, or applied directly rice bran awaken your senses and rejuvenates your mind, body and spirit. Developed with extracts and oils from flowers and plants, this oil emanates a lovely, sweet floral scent. The Nourishing Spirits Miracle Oil is made just for you, from head to toe. You can apply it to your face, hair, body and hands. It features six precious oils including exotic Baobab Calendula and Marula, based in sunflower seed oil. 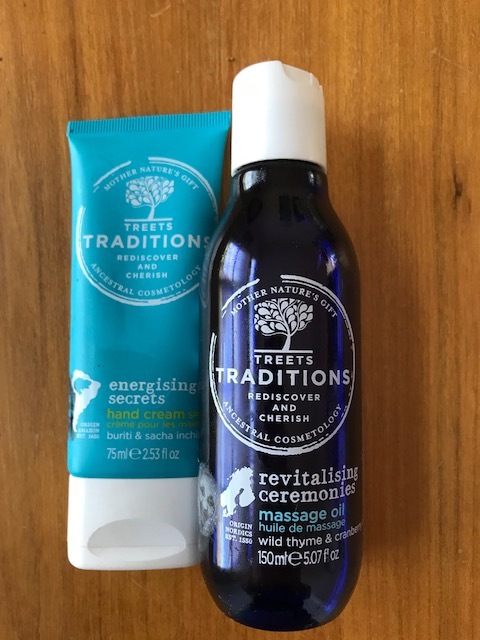 TREETS TRADITIONS’ Revitalizing Ceremonies Massage Oil is inspired by the therapeutic ceremonial herbal steam rooms plus salt and mineral baths from the North. Crafted with eucalyptus, wild thyme, and cranberry with volcanic minerals for clean and soft skin, this massage oil absorbs slowly and evenly. With natural oils, vitamins C and E, it’s also free from SLS, parabens and colorants for healthy and hydrated skin. It’s very refreshing. Try TREETS TRADITIONS for your ultimate summer skin care routine, available now from www.ulta.com.